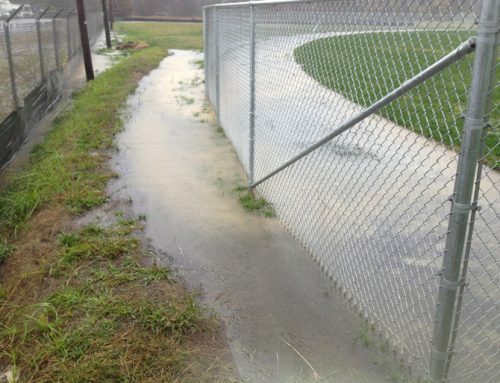 3 common water problems associated with athletic fields - Alpine Services, Inc. Fewer folks think about field and site design for water flow, although these considerations are actually larger and more important. Unfortunately, in the natural progression of events the field first becomes really bad (unplayable), then it gets everyone’s attention, and then it is rebuilt. This process usually takes 5-7 years – time lost for athletes and time for ill will to fester among stakeholders. 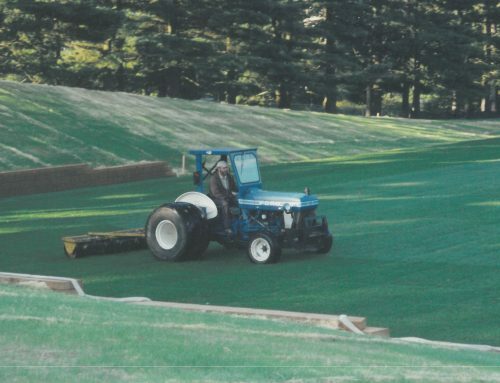 Typically, when Alpine is called to solve water problems on fields, one or more of the following issues are involved. Most fields are built on one or two mathematical planes, two if the field is crowned and one if the field is sloped from side to side. Water will leave the surface if the plane is true; if the surface has depressions in the plane then water will stay in the depressions and create problems. Even new fields can have planarity problems that hold water on them. Single plane fields can never be satisfactory unless there is a drought and they are irrigated, thus giving an even water application. Otherwise, on a single plane field, usually the top 1/3 of the field is overly dry, the middle third is “normal” and the bottom 1/3 of the field is too wet. In such cases the design is problematic and the solutions are expensive. Many sites allow surrounding water to run onto the field. “The field will soak it up” concept doesn’t work well. Site water intercept swales should have been installed on the sides of the field to carry away incidental water. 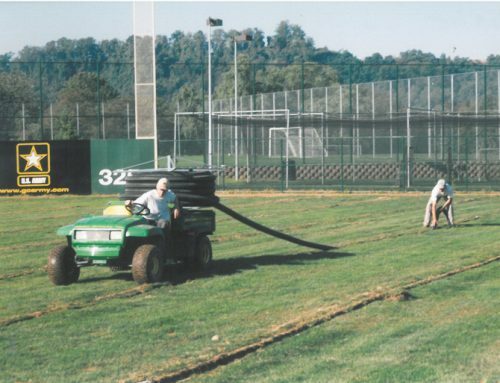 The lack of such swales is a very common problem that adds a water load onto the field surface, with guaranteed negative results. It would have been so simple to fix this problem when the field was designed and built, yet can be expensive to do after the fact. Fields are often built in flood plains or in natural basins, causing them to be abnormally wet when they receive surrounding water. This is fixable! The central issue is that there is no lower place for water to run to. This can be corrected with field drains, and, if needed, a simple pumping station to move water to other areas or structures. 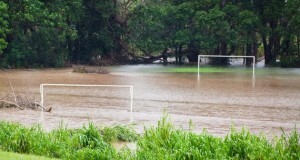 Wet fields are unsafe and unnecessary. Water is a known quantity and very predictable; there is little reason and less justification to have water problems on a field.